Melvin Seals’s Mighty High Picks! Jerry once called Melvin Seals, “the master of the universe” and it’s for good reason. 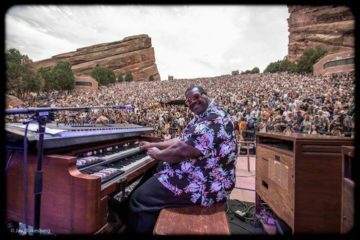 Since becoming the keyboardist for the Jerry Garcia Band in 1980, Melvin has brought his signature soulful sounds to the mix and continues to be a champion for the music to this day. We are very much looking forward to seeing him play in Vail with the Jerry Garcia Birthday Band. To get primed for the occasion, Melvin shared some of his favorite JGB and Grateful Dead tunes which he continues to work into his set lists each night with his band, Melvin Seals & JGB. Listen on YouTube and Spotify with commentary below. It’s all about that fusion – jazz. It’s quite a unique song that was unusual for Jerry to play…but it really brought out the best in him. I always liked the Dead songs that go in and out of time signature along with those long, stretchy jams. They have their intros, versus and choruses but can really go off from there, like St. Stephen, Uncle John’s Band as well as Help > Slip! > Frankiln’s. And we’re actually learning Help right now to add to our repertoire. This song was written in the 40’s, and I actually knew it from church. It seemed like the same awesome gospel song I always used to sing, but rearranged a bit. It’s very special. The beautiful rendition of this song starts out with some bass and has that sticky, sly, smooth, sassy groove that we know and love. It was always so soulful and almost magical to hear Jerry sing it, and the melodies pouring out of his guitar were nothing short of inspiring. I simply loved loved loved playing this tune with Jerry! People say it’s rare that a cover tops the original, but is seems this was tailor made for him to perform.